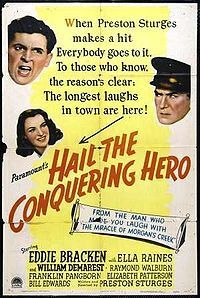 Hail the Conquering Hero (1944) is a satirical comedy/drama written and directed by Preston Sturges, starring Eddie Bracken, Ella Raines and William Demarest, and featuring Raymond Walburn, Franklin Pangborn, Elizabeth Patterson and Bill Edwards. Sturges was nominated for a 1945 Academy Award for his screenplay. Many critics consider the film to be one of Sturges' best. It was the eighth film he made for Paramount Pictures, and also his last, although The Great Moment was released after it. Sturges later wrote about his departure "I guess Paramount was glad to be rid of me eventually, as no one there ever understood a word I said."